The insanity of capitalism with its profits before people motivation is everywhere apparent. Millions spent on armaments while people die from lack of basic medical treatment, immense wealth accumulated by a tiny minority of parasites while millions die from lack of clean water and food, but the following news item probably sums up the madness best. ‘In a wide-ranging interview with the India-basedEconomic Times, Cargill CEO David MacLennan talks about how the globe-spanning agribusiness giant managed to turn the 2008 economic crisis into a “record year of profits” a remarkable performance, given that that year’s food-price spikes pushed 115 million people into hunger, as the UN’s Food and Agriculture Organization estimated’ (Mother Jones, 2 April). 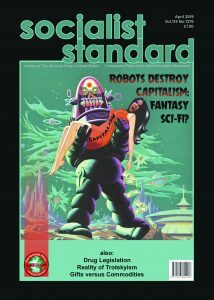 In last month’s Socialist Standard we dealt with the French economist Thomas Piketty’s book Capital in the Twenty-First Century and its many short-comings, but its publication and the many reviews it has produced in the mass media has thrown up some interesting aspects of modern capitalism. Here for instances is the journalist Philip Collins in his review of the book. ‘Between 1977 and 2007 the richest 1 per cent of Americans took an astonishing 60 per cent of the growth in national income. Sixty per cent. The wealth of the richest 85 people in the world is greater than that of the 3.5 billion people who make up the bottom half of the world’s population’ (Times, 2 May). Such statistics must give even the staunchest defenders of capitalism cause for concern. Professor Karol Sikora a former director of cancer services at Hammersmith Hospital and ex- chief of the World Health Organisation has expressed his views about treatment of the disease. ‘One of Britain’s top cancer doctors has called for expensive cancer drugs to be rationed for the frail elderly in favour of being given to younger patients’ (Sunday Times, 4 May). What the doctor really means of course is the elderly and poor patients being untreated. There would be a public outcry if he meant millionaires or even members of the royal family being denied the best possible treatment. As some of the treatments cost £50,000 per year it is obviously not for the likes of us workers. After a lifetime of hard work many thousands of workers because of ill-health and ageing find themselves reduced to living in a so-called Care Home. ‘The Care Quality Commission, which carries out inspections of homes, this week confirmed that in the past three years warnings were issued to 1,200 homes, of which 158 were forced to close. …….. A request to 150 councils revealed officials examined a total of 16,405 cases in the past 12 months, up from 13,880 in the previous year. The number of elderly residents who claim they were abused by care home staff also rose last year to 30,785, or 600 a week’ (Daily Express, 4 May). 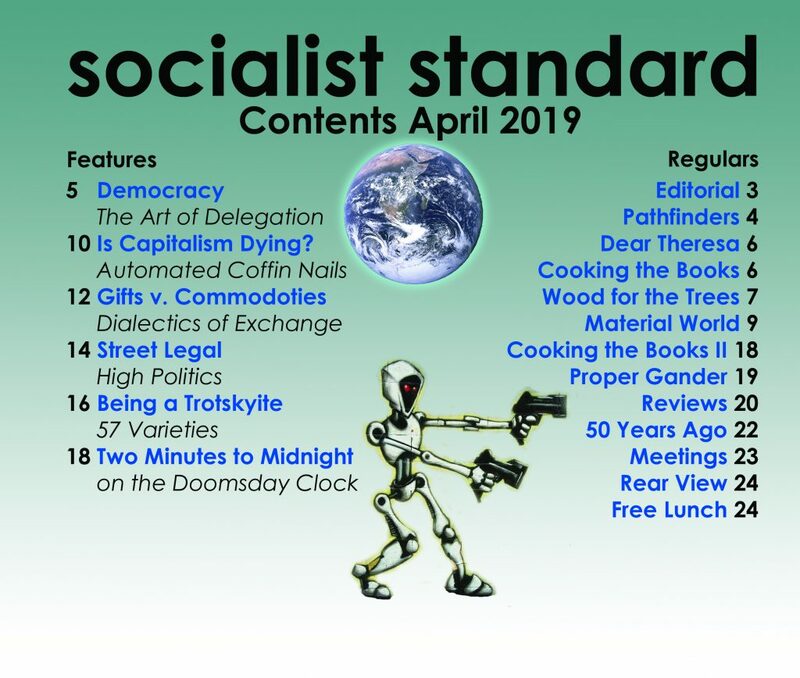 All sorts of proposals are put forward to deal with the situation but the reality is that the Care Homes are under-staffed and under-funded and are unlikely to be improved inside capitalism. The legal dispute over a divorce settlement between Silvio Berlusconi and his second wife shows the enormous gap between the millions who are trying to survive on $2 a day and the obscene wealth of the owning class. ‘Her demand for a one-off payment of 540 million euros (£440 million) caused talks to break down. Berlusconi, who is worth an estimated 6.5 billion euros, is said to be willing to offer her 200 million euros’ (Times, 10 May). At one time Britain was the wealthiest and most powerful nation in the world but these days are long gone. There is one economic category though where Britain still leads the world. ‘The number of billionaires living in the UK has risen to more than 100 for the first time, according to the 2014 Sunday Times Rich List. There are now 104 billionaires based in the UK with a combined wealth of more than £301bn, the list says. That means the UK has more billionaires per head of population than any other country’ (BBC News, 11 May). This must be a wonderful boost to Britain’s unemployed and homeless!